It still astounds me how so many great songs from the 1960s to the late 80s era received so much airplay, yet could never sell enough to make the chart. It’s even harder to fathom when so many people know or remember a song so well. The best examples have to be Van Morrison’s Brown Eyed Girl and Matt Monro’s Born Free! There can’t be many people over a certain age that don’t know nor remember those tracks, yet neither of them made the UK chart. Naturally there are hundreds, if not thousands that just became ‘turntable’ hits. Today’s subject, was championed by London’s Capital radio as well as both Radio’s One and Two. In particular, Noel Edmonds was a massive fan and played it on his Radio One breakfast show endlessly. When he moved to weekend mid-mornings he continued to spin it at a record (pardon the pun) rate, Roger Scott on Capital and David Hamilton were fans of it too. If I tell you that the chorus goes, ‘Brush your hair to the rhythm of the music playing on your radio’ you’ll probably think, I know that, now who was it? 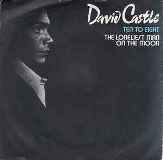 Well, it was a song called Ten To Eight and sung by David Castle. I caught up with David in America who was happy to be remembered and tells all. He who was born in Overton, Texas in 1952 and was the youngest son of a minister and a schoolteacher. He was surrounded by music and began playing the piano at the age of three. In 1974, at the age of 21 he moved to Hollywood where he became the staff songwriter for United Artists Music Publishing Group, “Within the first six months as a writer my songs were starting to be recorded by artists within the industry,” David told me. How did David becoming a recording artist in his own right? David: “A few years later, I was signed as the first artist on Parachute Records, a new custom label headed by hitmaker and legendary record mogul, Russ Regan. Parachute Records, which came under the umbrella of Casablanca Record & Filmworks, was distributed in the UK on Pye Records. My first LP for the label was entitled, Castle in the Sky and they released Ten To Eight as a single which became a DJ anthem in the States and around the globe.” In 1978, he contributed a track called Istanbul Blues in the Academy Award-winning film Midnight Express and was nominated for a Grammy for Album of Best Original Score. Excessive airplay of Ten To Eight and even an appearance on Top of the Pops in February of 1978 couldn’t interest enough buyers but as David told me, “I receive emails from Europe and around the world from couples who say it’s their ‘special song’ and people who remember it fondly. Charted or not, I consider myself extremely blessed to have experienced so many blessings that manifested as a result of one amazingly vivid dream that I had one night. A dream about my first love, Sherrie, who, bless her heart and soul, has now transitioned. Many years later Helen sent David an autographed picture with the inscription ‘David, It’s always Ten To Eight to me!’ “I knew exactly what she meant,” David said, “because ever since I wrote the song and recorded it, there have been so many, many times I’ve looked up at a clock, or my watch, or now, my iPhone, and sure enough, it’s Ten To Eight.